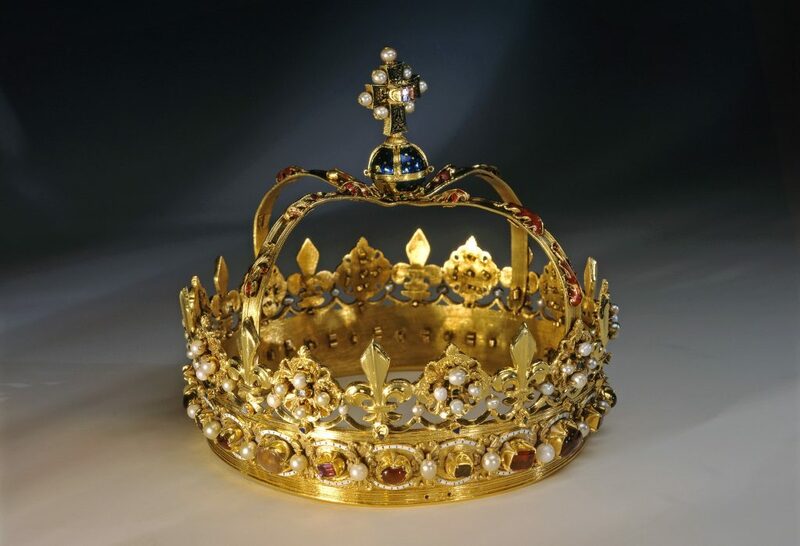 It’s 22 February 1540 and the newly-remodelled Crown is being worn for the first time by James V at his new wife, Mary de Guise’s coronation at Holyrood Abbey. John Mosman, the Edinburgh jeweller commanded to make the King’s new crown, had less than six weeks to complete the task. The finished article looked (and still does look) magnificent but those few who can look closely at the inside of the gold circlet would see rough file marks and hastily attached jewels – tell-tale signs of a rush job. Its making may have been rushed but since its first ceremonial outing the Crown has seen long service – not far short of 500 years so far, making it Europe’s oldest (still in service) crown. Over those centuries many pairs of hands have had the honour and privilege of looking after the Honours of Scotland – the Crown, Sword of State and Sceptre – and since 1999 it’s been my responsibility to make sure the Crown, looking good, takes centre stage in front of the Queen at openings of the Scottish Parliament. Saturday was the fifth opening of Parliament, and I’m lucky to be able to say, the fifth such event that I have had the honour of preparing the crown. It’s with a tinge of sadness that I consider this will possibly be the last time I’ll be involved in this historic, wonderful event. Those occasions have furnished me with some extraordinary experiences though, and it seems like no time at all that I was witness to the opening of the first Scottish parliament in 1999, the first such opening since 1706, and was fortunate enough to hear Donald Dewar’s now famous speech (I’d encourage you to read it online) prefaced by “There shall be a Scottish Parliament”. That historic event was held in the Church of Scotland’s General Assembly Building off Castlehill but by October 2004 the new Parliament building at Holyrood was completed and the Crown returned to within a couple of hundred metres of the location of its first outing, the Abbey of Holyrood House. Given that the ceremony in Edinburgh Castle only lasts a mere ten minutes, it’s hard to believe that the planning for the whole thing began back in February. Led by the Parliament’s events team, it is a remarkable feat of organisation which has to coordinate police, security services, the army, the City of Edinburgh Council and others. 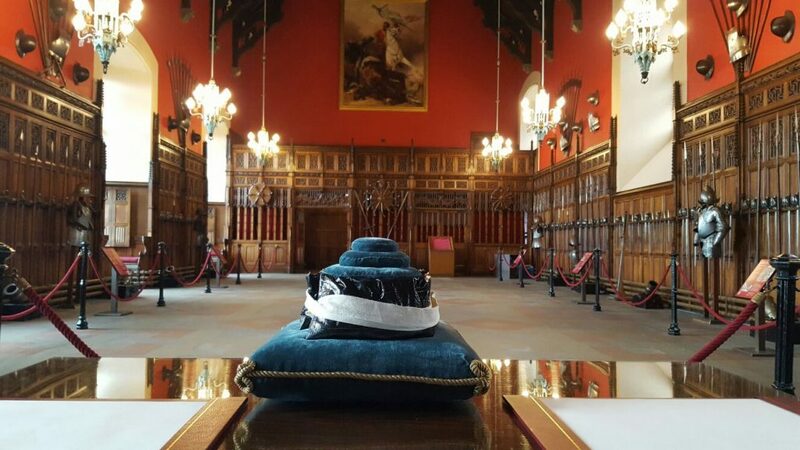 My role on the day is to oversee the Crown being handed over to the Duke of Hamilton in a small ceremony in the castle, and more importantly to ensure its returned safely after use in the Parliament’s debating chamber! 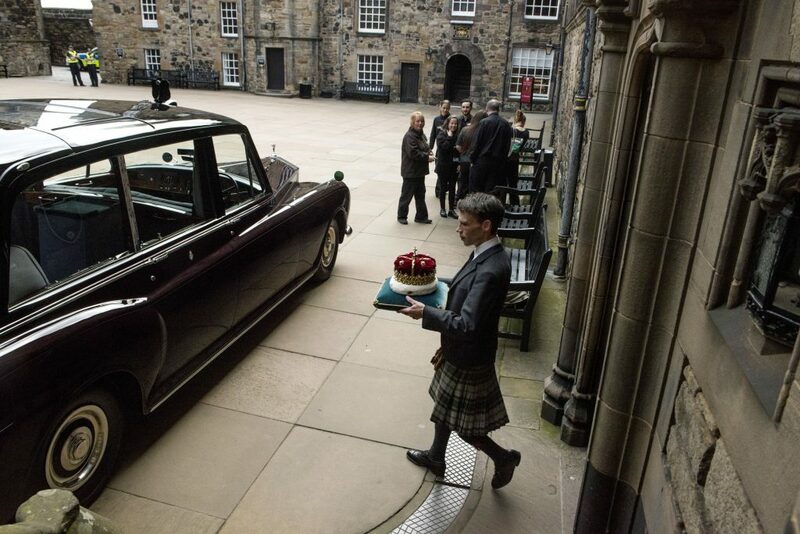 The Duke of Hamilton with the 500 year old Crown of Scotland in the Crown courtyard, Edinburgh Castle. Coordinating that handover requires a huge amount of effort from our highly trained staff, not to mention a number of of eye-wateringly early morning rehearsals to ensure everything goes like clockwork on the day. You would be forgiven for thinking that after four previous openings of Parliament the staff and I would know the process inside out (we do), but we leave nothing to chance, even going so far as constructing a dummy ‘crown’, consisting of a sandbag which weighs exactly 3lb 1 oz, which is the exact weight of the real thing, in order to recreate the ceremony as faithfully as possible before the big day! Another part of that preparatory work is to ensure that the Crown is looking its best for the big day. 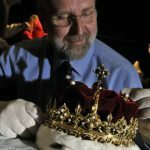 For many years, the Crown was cleaned and polished (along with the rest of the Honours) every year but these days, to reduce any risk of wear and tear, it’s given just a light buffing before its official duties. Somebody asked me what credentials a person requires in order to do undertake this job? I would say that the most important attribute is to have a steady nerve! As it’s not every day you are charged with handling a centuries-old piece of priceless finery. 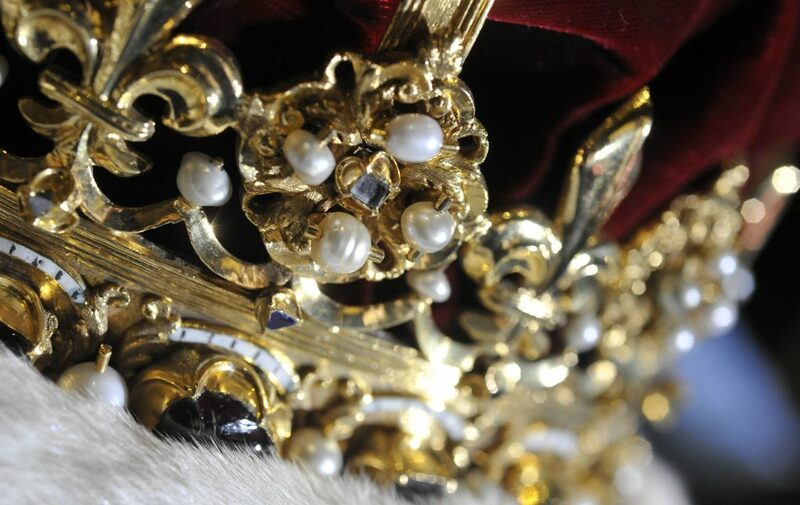 Thankfully the Crown, first worn by James V and last worn by Charles II, still looks as regal today as it ever did, and so its cleaning requirements are minimal. It’s still going strong after all these years, playing an important role in Scottish political life (it’s the oldest still active crown jewels in Europe). It serves as a tangible link through Scotland’s tumultuous past, and it’s been my pleasure to have borne responsibility for it during what is (relatively speaking anyway) a very small part of its history, but a very big part of mine! 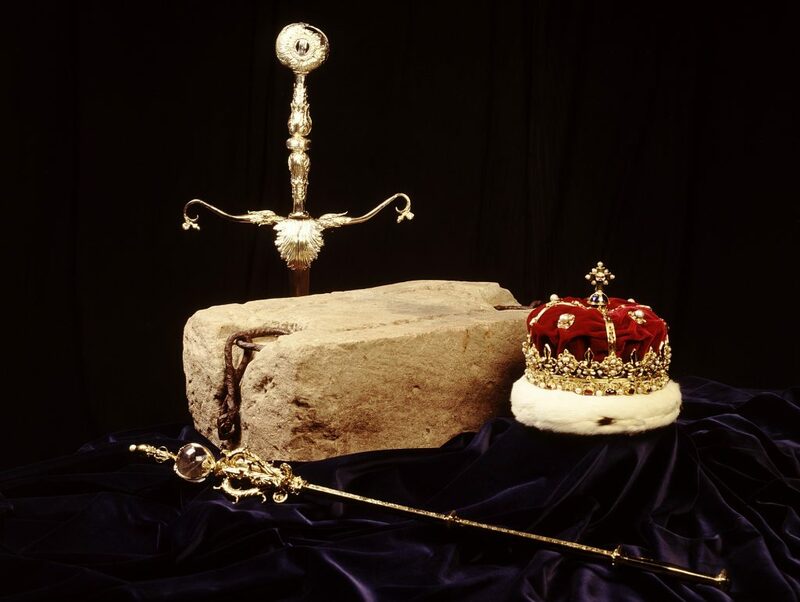 You can admire the crown along with the other Honours of Scotland at Edinburgh Castle.